Our house has been abuzz lately. Not because there’s anything exciting going on but rather because our lights have decided to go on the fritz. It has been so bad that we decided to unscrew two of the three lights to stop the constant humming. I’m sure you’ve read some of our stories about the kids getting up early for school. Early as in there are days we are walking out the door at 6:35 am. I’ve talked (translation: complained) about some days I just don’t even want to turn on the lights. Since we were needing to replace the lights in the kitchen, we wanted something that had the same flexibility and features as our other home automation gadgets. We’ve gotten a bit spoiled being able to change the temperature in the house, open the garage door, control the humidifier and more using our phones. Lighting options with remote capabilities would be a natural transition for our home. As a bonus, it wouldn’t make our kitchen feel like the inside of a beehive. For quite a while we’ve been eyeing the Philips Hue products at Best Buy, but just hadn’t pulled the trigger on the purchase. We’re frugal and tend to only purchase things like this when they need replacing. We upgraded the thermostat when we replaced the furnace. We installed the automated garage door opener when the remote unit finally gave in to the Iowa winters. Now that our kitchen lights are being temperamental, it seems like the perfect time to make the switch. There isn’t much needed to upgrade a traditional light fixture into a smart home accessory. A Philips Hue Starter kit and a smart phone or tablet with the Philips Hue app installed along with a router are all you need to light up your life. 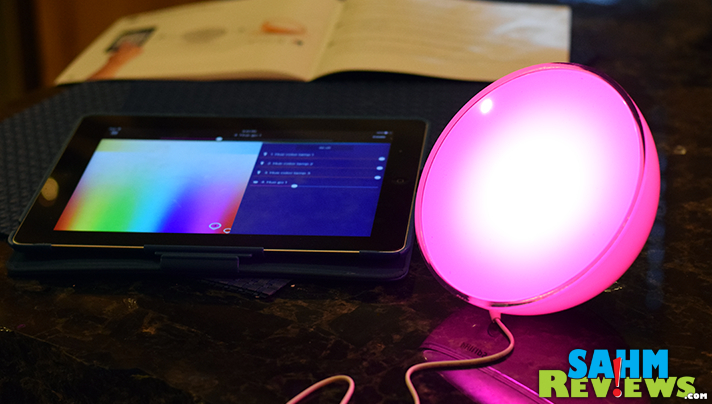 You can utilize the Hue Bridge that comes in the starter kit to power the lights right from your phone or tablet! 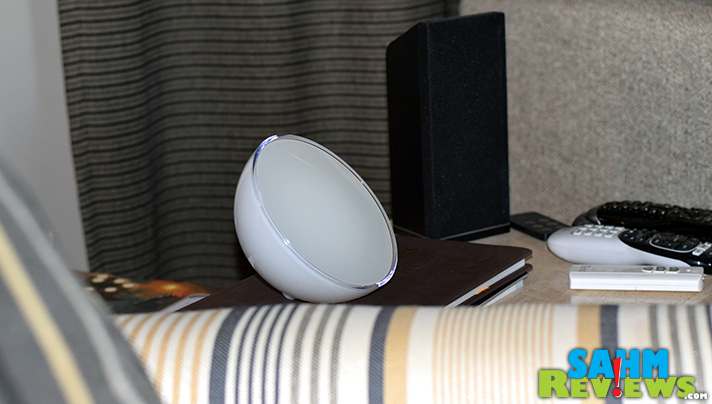 If you want to take it up a notch, you can add additional accessories such as the Philips Hue Go. I mention that it requires a router which is something that many people already own. For those people needing one (or ready for an upgrade), there are a number of routers available on the market but the Netgear® Nighthawk™ DST Router and DST Adapter with Geek Squad included is perfect for this type of automation project. The nice thing about this particular router is that it comes with Geek Squad service. When you purchase the router, you receive an email that day with set up instructions in addition to those included in and on the box. You can also chat with a GeekSquad.com agent to finalize the setup. I generally opt to leave the technical stuff for Scott to handle, but I couldn’t wait to get my hands on the Philips Hue system to find out what it could do. I left the router duties to him and the rest was all mine. 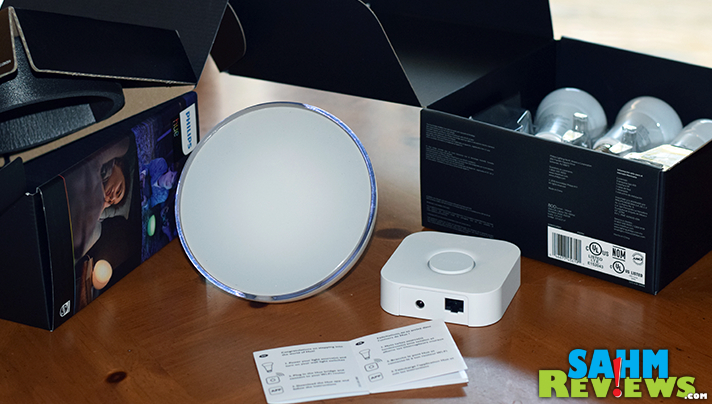 After opening the box and reading the very simple instructions, I removed the old bulbs from the kitchen light fixture and installed the Philips Hue color-changing light bulbs. And when I say “installed” that’s just a fancy way to say that I screwed them in like a normal light bulb. Yeah, not very difficult. After plugging in the Hue Bridge, I proceeded to download the app for changing the colored lights. Can I tell you how ridiculously fun that is to do? I’m going to. It was so cool! The variety of colors to choose from is like an artist’s palette. If you’ve ever messed with colors in a photo or graphics program or in any kind of app, it’s just like that. Slide the marker around until you find the right color. It changes the lights in real time so you can keep adjusting it until you arrive at the hue you’re seeking. 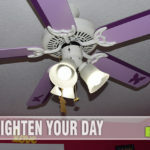 Multiple lights on a single light fixture can be grouped so the color and saturation can be set all the same or they can be adjusted individually so each bulb takes on a personality of its own. You can even use the app to have the lights turn on and off at certain times or even mess around with them while you’re away from home. I utilized the alarm featured in the app to have the lights turn on to a pre-determined “scene” of colors at a certain time. 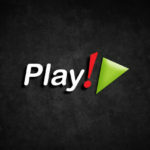 There are a variety of additional apps available that allow you to set predetermined scenarios for triggering the lights to take some action. Can you imagine having the lights flash when you receive an email from a particular sender or having them turn to blue when it starts to rain? Yup. Those are possibilities! Since our kitchen and eat-in dining area are the central part of our home, I felt like being able to change the colors to fit the time made great sense. Warm tones in the morning to wake us up slowly like a sunrise. Cooler colors in the evening as we sit down to watch some TV shows. Even having control of how bright or dim they are is a nice change since there isn’t a dimmer switch hooked up to the fixture. It will be nice waking up in the mornings and being able to change the color of the lights while my eyes adjust to the new day. Then I went to “work” playing around with the Philips Hue Go portable light. The interesting feature on this unit is that is runs at 100% capacity when plugged in, but drops to 40% when running on the battery. As with the Philips Hue bulbs, the palette of colors is pretty spectacular. You can get a feel for it in the picture above. We don’t have lamps in rooms other than bedrooms so finding a place to sit and read means finding a room with quality overhead lighting. If we want to read in the early morning or after sunset, there isn’t an option to curl up by a lamp with a blanket, a book and a cup of hot chocolate. The Philips Hue Go will change all that. It is portable so we can move it around to wherever we decide to sit and relax. Whether you’re using these to light a main part of your home or to change the feel of a child’s room, a play area or a sitting room, they’re a cool addition to your home. I’m certain that I’ll be using IFTTT to set up a bunch of other options for turning it on and off. Now I need to figure out how to turn all the lights to Blue when the Cubs win. For more information on creating a connected home, visit Best Buy. 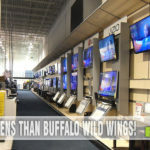 You can also connect with Philips, Netgear and Best Buy on Twitter. What room would you want to install these color-changing lights in? Wow these are awesome! I’d love to get some for my house! Wow that is cool. My son wants red walls but we don’t really want to paint, This would be a much better idea. Very neat and a much cheaper option! I have to pick just one room? I think my youngest son would have a blast if this was in his room. This is awesome! I love the way that those lights really set the mood for a room. Those lights are so cool. I think they would be fun to have in the family room, or even on the front porch! Cool idea. It would be fun to try this in one room. 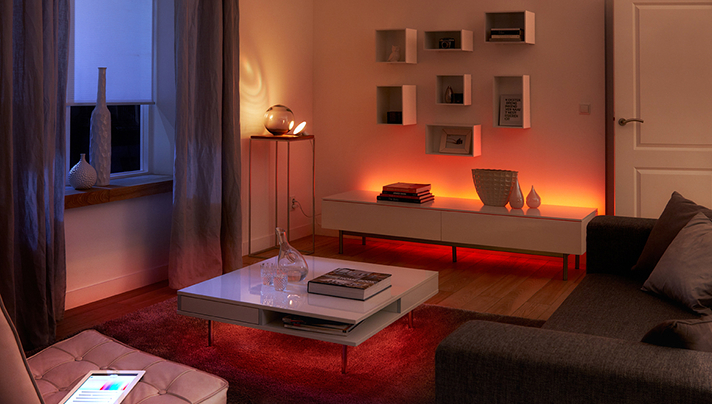 The hue starter kit from Philips sounds really cool. I love that this one is energy efficient and there are several settings. This kit looks so cool! I would love to try out warmer hues in our dining/living space – especially in the early part of the day. Wow they look so neat. I like different lighting options and these look like tons of fun. I am going to have to look into them! Well, that’s kinda cool! A fun way to redecorate, for sure! Using lights to liven up a room is a much cheaper idea. I really like that the light is programmable so you can get just the right shade as well as easily suit it to your current desires. These are way too cool. It would be awesome to try using them in a few different ways to get the right mood in a room. This is such a fun concept and takes mood lighting to a whole new level. These would be ideal in a living room for a party, holiday celebration or sporting event. I was just reading about this system. 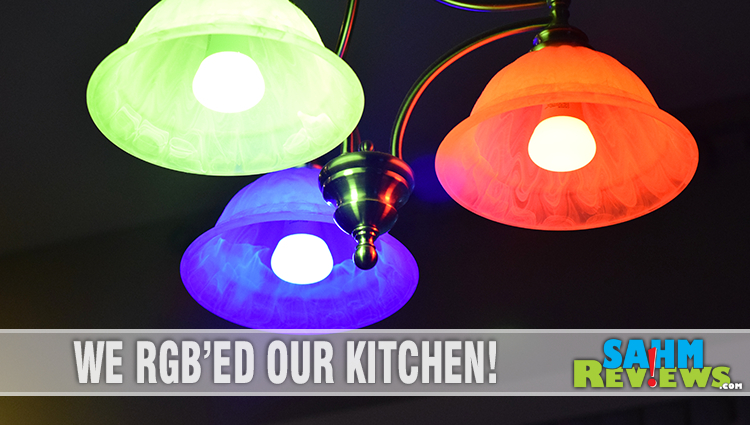 We swapped our CFL flood lights in the kitchen with daylight spectrum LEd lights that that was a big impact. Can’t imagine what you could do with these! They look so coo, now i want to get some for my house. This is really neat. My friend Jen has this in her new house and it changes color to the movies she watches. Avengers Age of Ultron was crazy cool. Hue is on our Christmas list this year. Those are pretty neat. If I had to pick one room for them it’d probably be my son’s room, I think he’d enjoy them quite a bit. I think it would be nice to wake up and adjust colors. The kids would get a big kick out of this too. 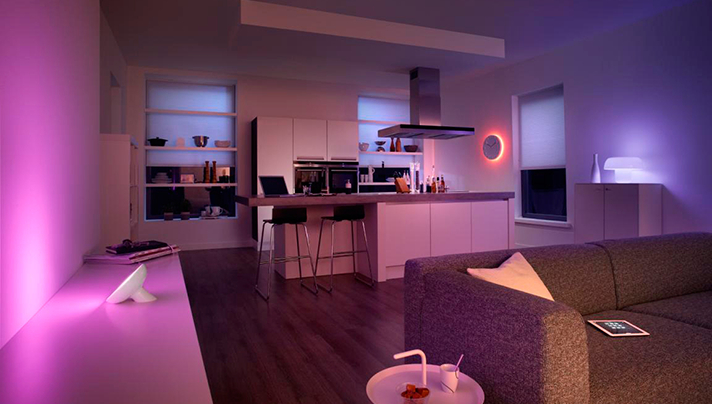 We love our Hue lights! There are a few additional apps out there that I’m looking forward to trying with our lights. Oh wow this is very nice and so effortlessly executed. I especially love the fact that there is an app to change the colors, my girls would have a field that with that. Also we’re in the market for a router and leaning towards NETGEAR but that price isn’t so friendly. These are so neat and my family would really love them. I think my girls’ room would be where we would put them first. My daughter would love to have a light like that in her room. Of course it would be set to a pink or purple. I have these and my kids love them!! They love changing the colors and having a dance off.